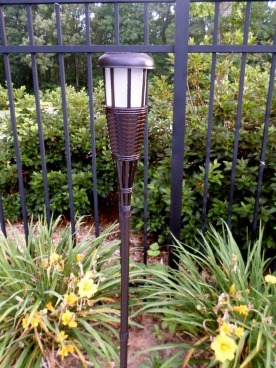 Outdoor party lights provide a festive atmosphere or a warm glow to your evening entertaining. Incorporate a variety of patio lights from flickering solar tiki torches to floating pool lights. Here in Georgia we love to keep our entertaining outside - by the pool or patio as much as possible. And the most important feature (of course besides food and drinks) is lighting. This is where the fun comes in. There are so many ways to do this with or without electricity. Thanks to solar and battery operated lights and torches, we don't use electricity at all. Pool party lights can consist of floating pool lights, patio umbrella lights, outdoor torches, and solar string lights. Place different kinds of light in different areas. We use solar string lights on the arched gated entry to our pool, flickering tiki torch solar lights around the pool perimeter, submersible LED lights for the patio table, floating lights are in the pool and string lights in surrounding bushes. The first place to start is where the guests will be gathered - around the table and the food. 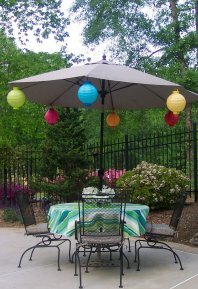 There are lots of different types of patio umbrella lights - from umbrella spiral lights to battery powered umbrella lights for lighting up the table. Whether you want a warm romantic glow or lights bright enough for a fun card game, you can find lights to suit the occasion. Other lights hang from the umbrella ribs - like these hanging paper lanterns. From floating solar orbs to floating LED balloons and beach balls. There are plenty of ways to light up your pool for your next pool party. Some tips to make your pool a night time attraction is to turn off the pool pump so that floating candles or balls don't bunch together. Better yet use lights that have an anchor attached to them. You will also need lots of lights to make an impact - you can't just do 3-5. Also the larger the better - it's not like lighting up a pond or spa - since it's a large area, the lights need to be large as well. 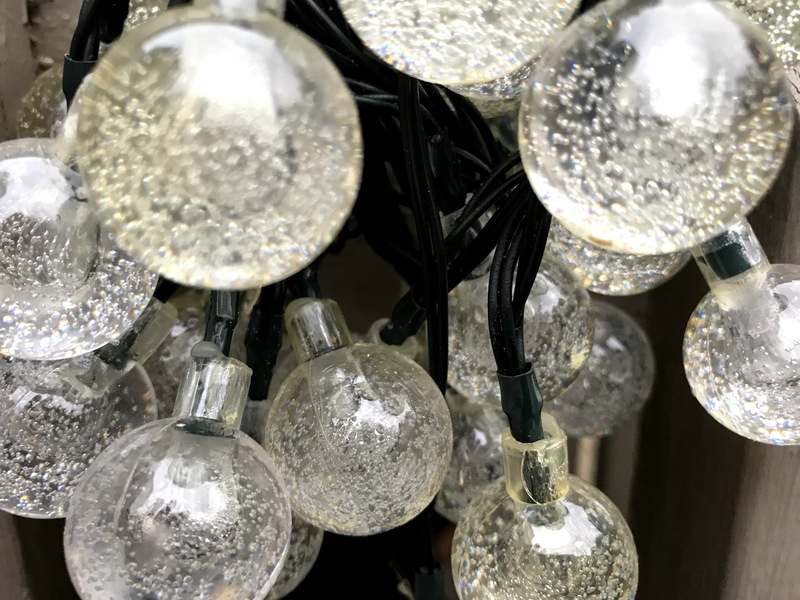 Outdoor string lights are not just for Christmas. Place them along your deck, fence, trellis, gate or arbor. We have several solar string lights that are in some tall evergreens by the pool that we keep up year round. Thanks to battery operated string lights and solar led string lights, you can place them anywhere even if you don't have access to electricity. An outdoor torch or yard torches add the right kind of outdoor party lights for you and your guests. You can choose from many styles whether you are wanting a more tiki party atmosphere using bamboo tiki torches or a more classic look using metal tiki torches. We found some flickering solar tiki lights that come on every night - no need for oil or for going around to light them. 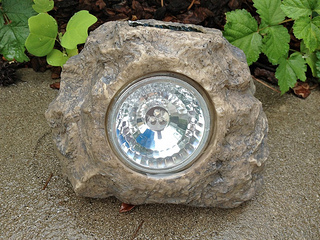 These outdoor party lights can be used anywhere - staked in the ground, set on rock walls and steps, or attached to deck railings. What's not to like about outdoor party lights that come on automatically every evening - without candles, without electric cords and with no batteries? We recently purchased some solar spot lights for some trees out by the pool. The first thing my husband said when they lit up the first night, " I think they are even brighter than our neighbor's spot lights that are electric." Solar lights have come a long way - we use solar walk way lights, led string lights, solar rock lights, spot lights and torch lights. 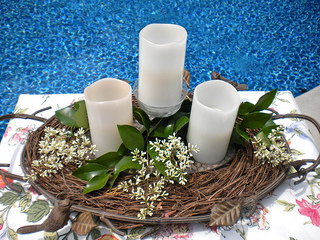 Find out how easy and inexpensive they are to use for evenings out by the pool. I can't remember the last time I've used real candles outdoors. Frustrated by candles blowing out or not lighting at all, I've found battery powered candles to be a great way to light up the evening outside. The new candles have flickering lights that look real and best of all they stay "lit" all evening. There are now some that are made for outdoor use so they are more weather resistant. 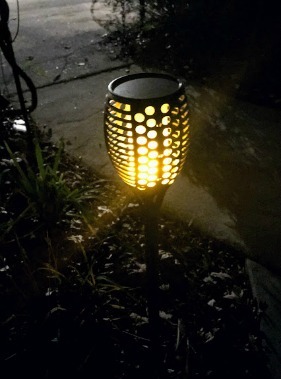 Use them to light up your patio table or set them on the steps to the pool or on a dark pathway. Use a variety of outdoor party lights to light up your patio tables, steps to the pool, walkways and the pool itself to provide not only safety but ambience as well.